Classical Homemaking: Pink Christmas Trees! Can You Help Me? Pink Christmas Trees! Can You Help Me? Is it roasting where you are? We're supposed to hit 100 today and tomorrow and then cool off next week. I'm so glad fall is coming! It's my favorite time of year! Some of you summer girls might be rolling your eyes at the idea of me talking of fall---let alone Pink Christmas trees---but we're on the last leg of the dreadful summer heat and I can't wait for it to be over! Today I'm asking for some help from my creative blogging friends! Last year, I played around with these rubber cone things I had found at the Dollar Tree and constructed this shabby little rose petal Christmas tree. I decorated it with some of my great-grandma's vintage jewelery. This year, I want to make a bunch more for my Pink Christmas-themed craft room. I want to use Styrofoam cones but need some ideas on a way to stabilize them. 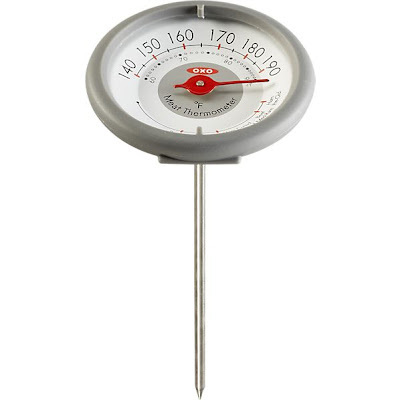 I'm wanting something that looks sort of like an upside down meat thermometer...but with a bigger base. Any ideas? 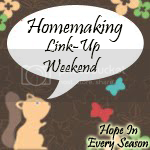 It's been a few weeks since I offered my Homemaking Link Up Weekend. I'm hoping to be more regular with it now that my favorite time of year is approaching and I'm past my early-pregnancy-sickies! I'd love for you to link up below if you've got a favorite post to share. Hi Sarah, I am right with you we have had triple digits as high as 112 & today is suppose to be 106* I am ready for fall!! Our air conditioner broke & I can barely keep up I am so drained from the heat by the end of the day! Thanks for hosting & drop by when you can. It's not too bad here in Maine, but I am longing for the crisp fall air too(my favorite season). As for stabilizing the trees... when I made some button trees with the styrofoam cones I used small pedestal candy dishes and pretty saucers that I found at the thrift store as their bases. Just glued them to it. You could also use a bigger cake stand and put several trees on it of varying heights and make a great table center piece. Your pink tree looks so beautiful! So glad to see you out today. Been wondering if you were okay. With this intense heat we are having, it is hard to think of Christmas. I am sorry I never got into craft work, so I am so help to you. I am sure someone will have a great suggestion. Take care and stay cool. Thank you for hosting, Sarah :) Cute pink Christmas tree - HPS too! Love the tree - but do sympathise with your problem. What about using silicon glue to glue glass nuggets inside the lid of a jam jar, etc, then gluing the foam to that with more silicon glue? This should be heavy enough to stop it tipping. Of course, if they are large enough, you could spike the styrofoam onto kitchen-roll-holder trees? Our weather has been much cooler the past week, after the hottest July on record! I'm already looking forward to fall, too. Glad to hear you're doing well! Cute tree! I've always just glued the bottom to another surface like a plate or saucer. I usually always decorated around the little tree too so the pattern on the plate didn't always have to match the tree. But if it did match, so much the better. Thank you for stopping by and Happy Pinks. Glad you're feeling better and I hope you have a splendid weekend. Maybe some golf tees glued to jar lids? Cute tress and you arent the only one creating a pink Christmas already. lol Glad I am not alone. Awwww, this is adorable! Happy Pink Saturday! This is such a cute idea, Sarah. I don't have any ideas with the base, but as creative as you are, you will come up with something. What about those candle-thingies, the brass kind that have a little spike, be a little opposite what you've got in mind, but it might work. Or a foam base w/skewers in the trees? It is a cute idea - hope you get it to stabilize. I kept seeing you around on the comments and decided to stop by and visit. Cute profile photo! First time I have seen GFC - is it like Facebook? Love the pink color of your Christmas tree, so pretty. Great way to use your great grandma's jewelry. Thanks for sharing and glad you are feeling better……. Adorable Pink C'mas tree! Thank you for hosting another fun party. Happy Pink Saturday to you and have a blessed Sunday sweet lady. Hi Sarah, I make a lot of Christmas trees! Wooden dowels inserted into small round wooden plaques would work. You will have to drill a hole the size of the dowel into the plaque and glue the dowel into it with wood glue. You could buy packages of dowels or one long one. You cut the dowel to the length you need. The dowels and plaques are VERY cheap and can be found at Michael's and Joann's and probably Hobby Lobby. You may be able to just glue the tree bottom on the plaques which are about 4 or 5 inches across. Good luck!! 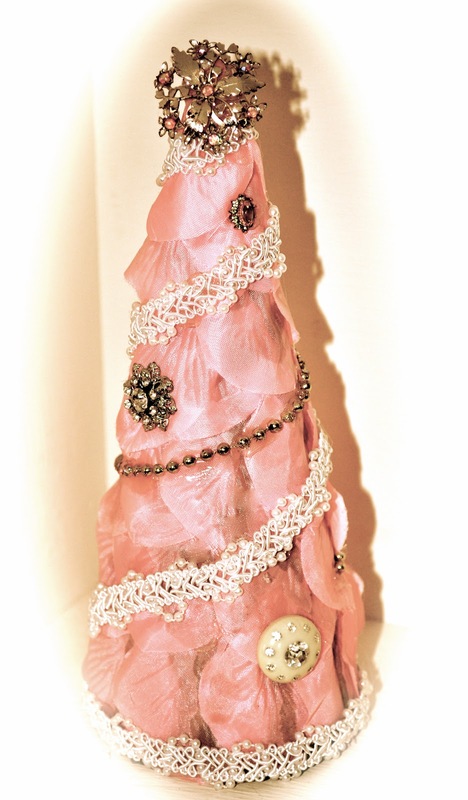 I love the idea of pretty pink Christmas tress and I see many have had good suggestions for a base frp you to try. Congratulations on your upcoming bundle fo joy! Glad to hear you are past the early discomforts. top on it hope this helps. Happy Pink Saturday, sweet Sarah. I hope all your babes are feeling well again. Your tree looks so pretty. I have been tempted to put a very small pink tree in my home office/studio, but I've just never got around to doing it.